Next week more than 200 violinists from 32 states and 14 countries will flock to New York for the Starling-DeLay Symposium on Violin Studies at The Juilliard School, and I'm happy to say that I'll be among them! This is my fourth time to attend the biennial event, and I've always enjoyed the shared wisdom, the amazing student performers and master classes, the pedagogy classes, and the opportunity to mix with colleagues. I'll be writing about it each day, and you can also read our coverage of the last three Symposiums here. This year's events begin on Tuesday. 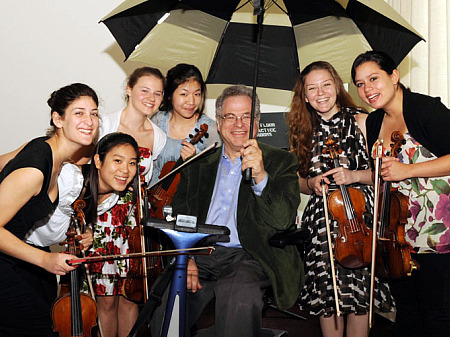 It's a great lineup, including master classes with Itzhak Perlman; Jorja Fleezanis of Indiana University; Ani Kavafian of Yale; William Preucil of Cleveland Institute of Music; and Sylvia Rosenberg of The Juilliard School. The students selected to play at those master classes are Robyn Bollinger, 21, of New Jersey; Elli Choi, 11, of New York; Gloria Ferry-Brennan, 16, of Washington; Ji Min Lee, 24, of New York; Marié Rossano, 19, of Washington; William Shaub, 20, of Ohio; Emily Shehi, 14, of Kansas; Ji-Won Song, 20, of Pennsylvania; Eric Tsai, 16, of Alabama and Angela Wee, 16, of New York. We'll also attend pedagogy classes (they gave us quite a repertoire list to bring -- very heavy on Bach, which makes me happy). Brian Lewis of the University of Texas at Austin will discuss "The Musical Gems of Josef Suk"; we'll have two separate classes on various aspects of Bach's solo works, one with Katie Lansdale of The Hartt School and the other with Michael McLean of The Colburn School; and Odin Rathnam will talk about "Principals of Ivan Galamian in Practical Application." Well also hear William Preucil and Giora Schmidt in recital. So be sure to check in with us at Violinist.com each day this week, starting Tuesday, for our coverage of this event, and you are also welcome to follow us on Facebook and Twitter! The SoCal Chamber Music Workshop still has openings for string players. Held at Scripps College in Claremont, Calif., July 21-17, the intensive week will feature and outstanding faculty including the Daedalus and Hausmann Quartets. Information, application, and a video of a past workshop can be found at socalchambermusic.com. Come join us for a wonderful week augmented with many optional activities. Is this symposium solely for violin teachers? Or is it open? Have a wonderful time in NYC, Laurie! My teacher (a fellow v.commie) is there too. Maybe you will bump into each other. "Preference is given to participants who are professional violinists, teachers, post-graduate and college students. High school-age (and younger) participants may be admitted to all sessions on a space-available basis, but only as observers in technique and pedagogy sessions." thanks Joyce-I wonder if that means adult non-college trained violinists need not apply... maybe with a reference? Elise, that is precisely what I infer. Marjory, look at the list of master class students for this year, again predominantly female. Those students were from Perlman's own studio. The student artists this year include eight young women and two young men.